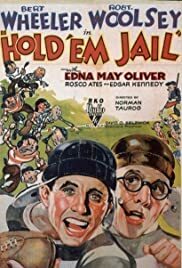 Two yokels are framed and sent to prison, but wind up playing football on the warden's championship team. Kravette: Helping a prisoner to escape? I'll put you on the rock pile for this! Spider Robbins: If you do, we'll throw rocks at you! This film really displays the differences in style between Wheeler and Woolsey and Laurel and Hardy. In "Pardon Us", Stan and Oliver are sent to prison, and in every situation where they try to be helpful, they end up with the short end of the stick. When Bert and Bob are sent to prison, they end up running the place after a short time. Wheeler and Woolsey certainly did not possess Stan Laurel's comic genius, but they are optimistic and make us feel that the underdog can triumph. We do not sympathize with Bert and Bob the way we do with Stan and Oliver. Bert and Bob are too arrogant and too aggressive for our sympathy, but we do get a special delight in seeing them triumph. Edgar Kennedy is very funny as the warden and teen-age Betty Grable is as cute as can be as the warden's daughter. The football sequence is not as funny as the Marx Brothers' "Horse Feathers", but it is amusing. Edna May Oliver and Roscoe Ates add their brands of insanity to the mixture. I only wish there were some musical numbers to spotlight the abilities of Bert, Bob, and Betty Grable. For low comedy fans, this film is certainly worth viewing.